A pretty fun game, I could spend all day playing, but I have to do a review. 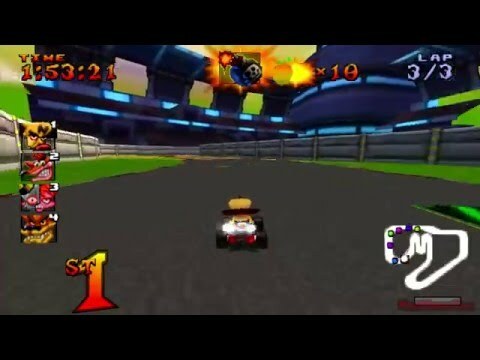 With the option to play the main story with the vibes of the original games but with a more 3D mobility and multiplayer option in Crash Team Racing style racing but with the great ability to combine cars of different characters within the same race for a more tactical advantage, since it lets you manually shoot other players. I really liked the variety of activities that can be done within the game, so your boredom is locked up all the time. Demo to the PlayStation One title Crash Team Racing (CTR). Now you can add videos, screenshots, or other images (cover scans, disc scans, etc.) for Crash Team Racing Demo [U] [SCUS-94459] to Emuparadise. Do it now!